Ashley (Shoum) Gliss â€™09 and Ed Gliss â€™11 both work for Michelin. They have a daughter, Avery. Ashley (Shoum) Gliss ’09 (mechanical engineering) was focused on her senior design project, her final year of school and a new job she would start after graduation at Toyota when she first met Ed Gliss ’11 (mechanical engineering). But her senior design project centered around a Polaris four-wheeler that was stored in the Formula SAE Racing team’s shop. And she couldn’t help but notice Ed, who was on the Formula team, making the carbon fiber components of the racecar. By that winter, Ashley said, she was smitten. 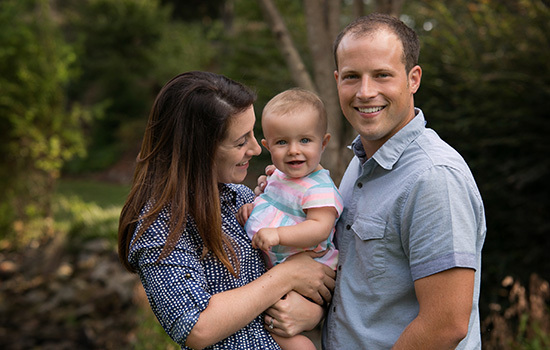 And today, the two car-loving engineers who both work at Michelin in Greenville, S.C., have a 1½ year old daughter, Avery. It wasn’t always a smooth ride for the couple, though. When Ashley graduated, she worried about keeping the relationship going long distance for two years until Ed completed school. She even tried to break up with him on May 24, 2009, but Ed wouldn’t let her. In fact, he teased her about that day and 5/24 became their special date. They were married on May 24, 2014. The plan was for Ashley to stay at Toyota in a two-year rotational program until Ed graduated and then they would look for jobs together. Ashley, though, had been working with Michelin in her job at Toyota and was intrigued by the company and living in South Carolina. She applied for an opening and left Toyota after a year. Ed joined her there in 2011. Although they both work for Michelin, they are in facilities located 45 minutes apart. And although they are both mechanical engineers, their work is different. Ashley said she is more analytical and likes paper calculations. Ed prefers hands-on projects. Ashley is a technical account manager, working directly with companies such as Mercedes, BMW and Audi to develop new technology for next-generation vehicles. At the Michelin test tracks, he can easily reach speeds in excess of 100 miles per hour.